The South Pacific island nation of Palau has declared all the waters within its Exclusive Economic Zone to be a marine mammal sanctuary for the protection of whales, dolphins and dugongs. Harry Fritz, Palau’s minister of the environment, natural resources and tourism, announced the new 600,000 square kilometer (231,660 square mile) sanctuary on behalf of President Johnson Toribiong at a news conference Saturday during Oceans Day at the Convention on Biological Diversity meeting in Nagoya, Japan. “From ancient times to today, we have conserved our biodiversity through the tools of “bul” or moratoria, and protection of critical areas,” said Fritz. A close group of islands, Palau has at least 11 species of cetaceans in its waters, including a breeding population of sperm whales and as many as 30 other species of whales and dolphins. Palau’s dugongs are the most isolated and endangered population in the world, said Fritz. “This sanctuary will promote sustainable whale-watching tourism, already a growing multi-million dollar global industry, as an economic opportunity for the people of Palau,” Fritz said. 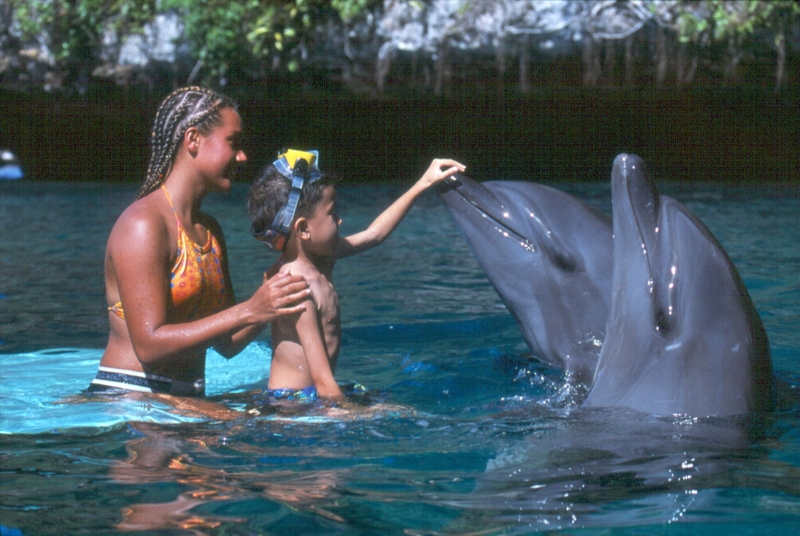 Much of Palau’s economy comes from tourism and the country hosts Dolphins Pacific, the world’s largest dolphin research facility and the Palau International Coral Reef Center, a modern aquarium and research facility specializing in tropical coral reefs. The region’s spectacular underwater biodiversity includes over 1,500 species of fish and 700 species of coral and anemone. “It is a well-established scientific principle that to protect migratory species it is necessary to protect them not only in their feeding areas and migratory routes but also in their breeding grounds,” Fritz said. Establishment of the sanctuary is intended to prohibit the deliberate hunting and harassment of any marine mammals. But Palau has only one patrol boat at its disposal to patrol waters that cover an area just a little smaller than the U.S. state of Texas. The boat is supplied by Australia and operated by the government of Palau. Fritz said that Palau is seeking assistance from neighboring countries in patrolling and surveillance of its EEZ for illegal taking of marine mammals. “We urge other countries to join our efforts to protect whales, dolphins and other marine mammals – for the sake of the species, as well as the future economic, social and spiritual development of coastal peoples,” he said. Palau also needs help to deal with all the illegal fishing taking place in its EEZ. “Last August I received a report from the U.S. officials in Guam showing more than 850 vessels fishing illegally in Palau’s waters,” Fritz told reporters in Nagoya. Illegal fishing with the use of dynamite has also been reported. “Palau’s support for the conservation of marine species underscores this small island nation’s tremendous commitment to protecting life in the oceans that surround it. Other countries should join Palau in safeguarding species in their waters,” said Dr. Susan Lieberman, director of international policy for the Pew Environment Group, which has contributed a grant to fuel the patrol boat. The Republic of Palau lies in the Pacific Ocean, some 800 km (500 miles) east of the Philippines and 3,200 km (2,000 miles) south of Tokyo. The islands were seized by Japanese ships during World War I and governed by Japan until 1947 when the islands passed formally to the United States under United Nations auspices as part of the Trust Territory of the Pacific Islands. Emerging from trusteeship in 1994, Palau is one of the world’s youngest and smallest sovereign states. About 70 percent of Palau’s population of approximately 21,000 residents, live on the island of Koror. Until now, Palau has voted with Japan in favor of commercial whaling at the annual meetings of the International Whaling Commission and the establishment of its marine mammal sanctuary is viewed as a signal that Japan may no longer be able to count on Palau’s vote for whaling. More than 1,500 whales are hunted and killed each year for their meat, most of them by Japan. This occurs despite a global moratorium on commercial whaling since 1986 and the establishment of the Southern Ocean as an international whale sanctuary in 1994. Palau, in partnership with the South Pacific Whales Research Consortium, Whaleology, and the Pew Environment Group, announced last week that it is beginning to lay the groundwork for a sustainable whale-watching industry. During a presentation Wednesday night on the importance of marine mammals in the region, the Queen of Koror Bilung Gloria Salii said Palau is in the process of completing a whale-watching feasibility study. At the event, entitled, “The Role of Marine Reserves and Wildlife Sanctuaries in Conserving Large Pelagic Species,” hosted by the Pew Environment Group, Salii said whale and dolphin-watching alone already generates approximately US$23 million each year in direct revenues worldwide. May stupendous achievements always be with you!